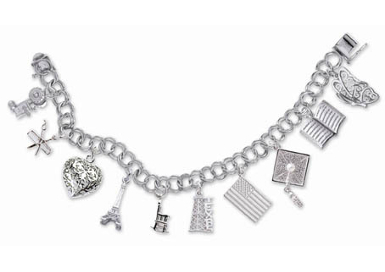 Graduation and travel charm bracelets are quite popular in today’s jewelry market. Creating new styles of charms and charm bracelets, the allure of the charm bracelets serve as storybooks, detailing the events of someone’s life. Charms to mark significant milestones in life, such as sweet sixteen, birthday, graduation, and travel. Great to give a young girl, so her life story can be one day her treasured memories.